Marco Rubio’s dog whistle politics – is Florida’s Junior Senator Donald Trump’s political heir? A common narrative that has emerged that Donald Trump serves as the ideological heir rhetorically to the likes of George Wallace and Ronald Reagan in pushing buttons using racial code to garner voters. But Florida’s Junior Senator who is anxious to be nominated by the GOP for President in the future and has been able to maneuver behind a cloak of respectability created by the media and Republican establishment isn’t held to such a standard. But yet this past week, when repeatedly given the opportunity, Rubio declined to repudiate Trump and doubled-down on his backing for the GOP nominee for President. Why? Rubio will seek a future GOP nomination and sees the Trump voter as his key to success. Florida’s Junior Senator has used more subtle/coded language in the past to appeal to the same voters Trump does. Marco Rubio has proven via his own previous actions and record that respect for women isn’t one of his priorities. In fact, his views on reproductive rights put him squarely in the camp of Trump and his supporters. This is wonderfully explained by the outstanding Beach Peanuts blog. Rubio is aligned with racist and corrupt pols in the same fashion as Trump. He cannot afford for the Trump movement to be overtaken by a more respectable and softer-toned conservatism. The voting record of Florida’s Junior Senator makes him among the most conservative members of either chamber in Congress. His sympathy lies with the Trump movement if not with the nominee himself. Rubio’s coded racial appeals are among the elements that allowed him to surge in the polls in early GOP Presidential primary/caucus states and remain relevant in the race longer than his mentor Jeb Bush. Rubio recorded a surprisingly strong 3rd placed finish in the Iowa Caucus after baiting the local electorate with a tone that was alarming. While Rand Paul was determined to serve as the ideological heir to the likes of Barry Goldwater and Jeb Bush adopted a more William F. Buckley/George F. Will tone, Rubio played “dog-whistle” politics in Iowa to great success. He was eventually overtaken by Trump but now with the tycoon faltering, Rubio will seek to coalesce the right wing elements and racially-motivated voters that Trump corralled into his camp for a future run. Also, in the near term Rubio needs the Trump vote to best Patrick Murphy who despite the failings of the Democratic Party, remains in a competitive position to potentially win on November 8. But perhaps it is more than simple politics as expectations for Rubio cannot be any higher than they are of Trump – Florida’s Junior Senator is incapable of high intellectual thought and simply repeats coded messages like one of those pull-string toys you buy at Target. Rubio is programmed with platitudes and coded racial hits at the current President and sometimes he is capable of delivering his lines masterfully. This should serve Rubio well into the 2020 cycle with a party which has been whipped into a frenzy by Donald Trump. Upon reflection I have come to realization that Rubio’s controversial statements about President Obama, the ones the national media were asleep to during the primaries, but if made by Trump would lead to hours of breaking news and shout shows on CNN, were probably designed to race-bait. Interestingly he made odd claims about his Republican rivals in primaries also, in a very Nixon/Reaganesque style. This quote I believe was directed at Ted Cruz and Rand Paul. Some of these quotes also can explain while Rubio seeks to appeal to voters that find race a motivating issue while being pushed along with few questions asked by the GOP establishment and a mainstream press that has long proven that they believe faux patriotism and war sells and is good for ratings. Coded racial appeals to voters about President Obama, the nation’s first African-American President seeking to “deliberately weaken America,” is racial no matter how you spin it. This appeals to the element that Trump has awoken that feels Obama is not a true American and that he cannot possibly have the nation’s best interests in his heart. Trump’s appeals may have gotten the media’s attention and carried him to the GOP nomination, but Rubio made a direct appeal to the same voters earlier this year. Having survived in the Presidential race longer than more senior and seasoned colleagues, Rubio understands with Trump discredited and out of the way he can inherit the mantle of the racially-charged voter that is appealed to via dog-whistle type messages for a future national run. Here at home in Florida, it serves Rubio well with the great unwashed whom he rode to victory in 2010 and again will need in 2016 against a less-divided Democratic Party to prevail. Anti-intellectualism and coded racial language is part of the Rubio playbook. His sympathy for Trump’s candidacy and plight is designed to set him up for 2020 and 2024 as a potential heir to the Trump legacy. let’s see if we can write one article in this election cycle w/o saying dog whistle. Just call it what it is. If the polls showing Hillary winning Florida are correct and Lil’Marco wins too I’d love to meet some of the voters that voted for both. 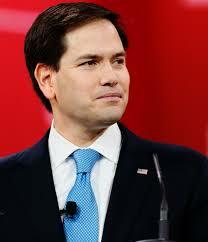 Rubio is as shallow as a puddle of water and dumber than a rock. Let’s hope Murphy can pull thus off and send Rubio home for good.